Chromatic Theatre presents Euripides’ Medea, its sophomore production. Pictured, left to right: Justin Michael Carriere, Carly McKee, Artistic Director Jenna Rodgers, Chantelle Han, Makambe K. Simamba, Ali DeRegt, in rehearsal. Photo Credit: Mike Tan. None can deny that the past few years have seen an increase in racial(ized) tension, particularly in the United States. The nation’s attention has been captured by recorded incidents of police brutality against African Americans, and the failure of the courts to serve justice. And so, none can be surprised that the marginalized have taken to demonstrations in order to spread the dehumanizing reality people of color face daily. And one such demonstration is Chromatic Theatre’s bold production of Euripides’ Medea. Directed by Alyssa Bradac, this ancient Greek tragedy tells the story of Medea (Chantelle Han), wife of Jason (Justin Michael Carriere), whose husband abandons her and their two sons for the daughter of King Creon (Carly McKee). The political marriage drives Medea to seek violent revenge against Jason, his bride-to-be, and her father. Those familiar with the mythology surrounding Medea will know that she is a barbarian, a term used to identify non-Greeks. Medea’s foreignness puts her at a social disadvantage among the Greeks, a major reason why Jason wants to marry into Greek royalty as it would benefit him socially. And this marginalization is made worse by Medea being a woman. In Greek society, Medea tells us, the husband rules his wife. Women are expected to stay home with the children, live private lives while their husbands engage with the public sphere. And worse still, Medea says, is that a woman cannot divorce without attracting disgrace. For Medea, it is an injustice that women lose independence, the capacity to act freely, upon marriage. Given this understanding of the character, the audience struggles to reconcile both their sympathy and disgust for Medea when she murders her own children as part of her vengeance against Jason. And this reconciliation is made more difficult by Chromatic Theatre’s artistic choice to cast Medea as a person of color and Jason as a white man. For the colour conscious casting introduces new politics onstage, politics that its modern audience have seen unfold across the media in recent years. From the beginning, we see develop the sort of oppressive conditions that encourage marginalized groups to gather and protest in order to make their issues known. At the same time, the audience sees how easy unrest can turn violent, as it did in Ferguson or during the 1992 Los Angeles riots, and that when it does there are no winners. Everyone loses, but none lose more than our children, the next generation who now inherit a prolonged history of hate and violence. The immediate sadness that washes over Han in the play’s final moments is not just for the loss of her two sons, but the possibility for peace which she has threatened with her actions. Certainly, prejudice pushes Medea towards the edge, but what truly hurts her is the failure to properly dialogue with Jason who fails to grasp her perspective. Here, we are asked to question how often the public tries contextualizing the frustrations and anger of protesters? How often news media goes beyond simplified terms like ethnic violence or racial conflict and employs an intersectional approach to social issues? As we see, it is never just one thing, but multiple, interdependent factors e.g. race, class, gender. This particular staging of the play serves as both a call for understanding and a warning of the path we continue to travel down. Bradac’s direction is strong, displays the sort of energy such a production requires. The Chorus (McKee, Jenna Rodgers, Ali DeRegt, and Makambe K. Simamba) is kept in fluid motion, involved in the horror of Medea’s revenge plan. Although, the use of pocket flashlights by the Chorus is awkward. The Chorus members shine light on whomever is making a character change, like McKee into King Creon or DeRegt into Aegeus. Besides the brief pause created by taking time to shine (a flimsy) light on someone, the flashlights feel unnecessary considering the effective change in tone and gesture the actors employ. Han commands the stage as Medea, playing the character with great urgency. Truly, the actress gives a captivating performance as she makes immediate Medea’s desire for revenge, at the same revealing the hurt that motivates her vengeance. Carriere’s Jason is played with the most infuriating arrogance, well deserved for such a despicable, narrow minded character. What a treat it is for the audience when Han, an unstoppable force, meets Carriere, an immovable object, onstage. Simamba establishes a determined presence as Nurse. DeRegt has the misfortune of playing a character who appears for the sake of plot convenience. To her credit, the actress does what she can with what is given to her, unfortunately there is simply not much here. Though brief, McKee does well as Creon. While yes, the production is a contemporary staging, it remains difficult to identify a clear aesthetic choice in Benjamin Toner’s costume design. The costumes are unclear in terms of what sort of setting or period they are supposed to reflect. In contrast, Kathryn Smith’s set evokes an earthy, at odds with both the natural and supernatural world feel, which is strongly emphasised by Miquelon Rodriguez’s ethereal sound design. 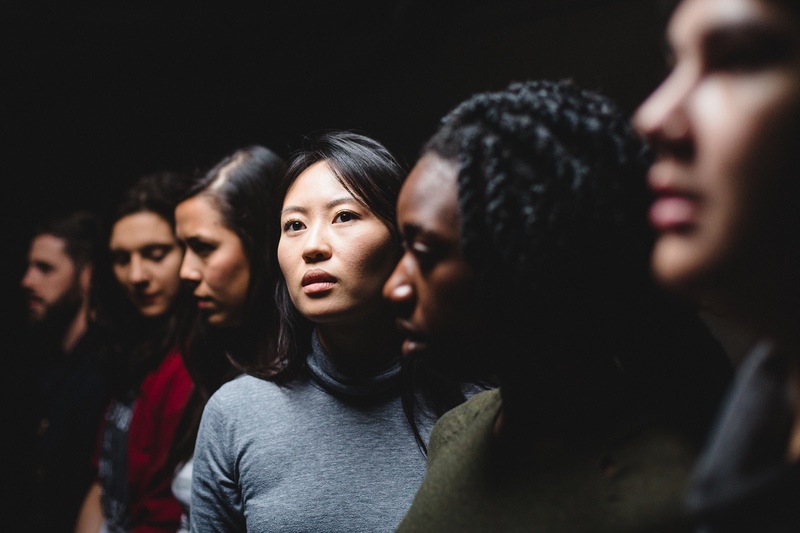 Ultimately, the experience of marginalized peoples comes alive in Chromatic Theatre’s thought provoking, socially relevant production of Medea. The company reimagines the politics of its tragic heroine for an age disturbed by profound, complex levels of dehumanization. A must see. Chromatic Theatre’s Medea ran September 24 – October 3rd, 2015 at the Motel Theatre (Arts Commons).